that we've been after for years and years. as I thought it would be. and still get our potatoes and bread from time to time as well. "are we grown up now?" a little lesson in asparagus cooking as well. 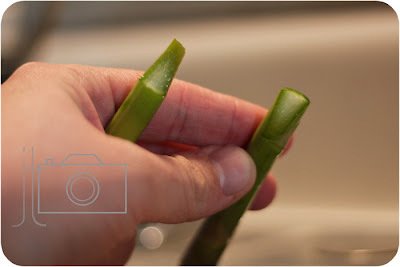 Start by washing the asparagus. The asparagus has a natural breaking point at the bottom. Find that point and break the ends off each piece. Or you can find that part on one and cut the others. 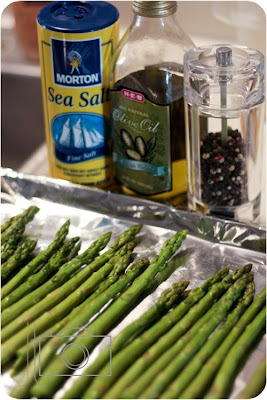 Lay the asparagus on a cookie sheet or roasting pan. Sprinkle some olive oil on the pieces and make sure each one gets coated. Then sprinkle on some sea salt and add some cracked pepper. 8 minutes for softer asparagus. You could also sprinkle with parmesean cheese once its out of the oven. 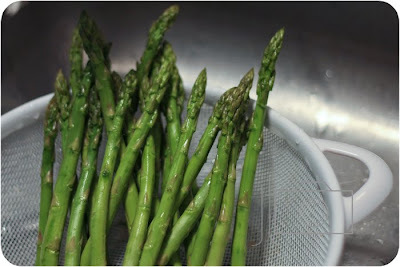 You could grill the asparagus or also boil it on the stove. Oh that looks good! 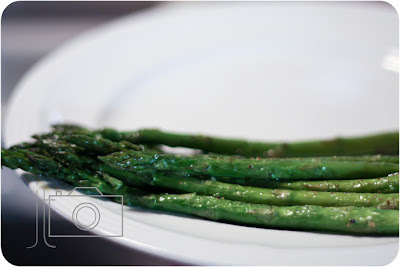 I love asparagus, and I usually sautee it! I didn't think about baking it. Much easier. Thanks for this! Love asparagus. Thanks for the great HOW TO Jamie! I normally steam and they lose so much nutrients that way. I will have to try this next time.